Joseph Gordon-Levitt does not go gently into that good night as a healthy twentysomething who discovers that he has a malignant spine tumor in 50/50. More accurately, his garrulous best buddy Seth Rogen won't let him. Hell, he's probably used to it. Gordon-Levitt is plenty morose even before he learns of his life-threatening condition. Through the shock of Gordon-Levitt's diagnosis and the exhaustion of his chemotherapy treatments, Rogen keeps up the chatter, drags him to bars, and secures medicinal marijuana for his straight arrow friend (the audience is left to draw its own conclusions about who benefits more from this arrangement). In this we see that combining the cancer weepie and the buddy movie is not so unusual as it seems - on the contrary, they are one and the same. Everyone confronting terminal illness should have a friend like Rogen. Of course, Rogen can't help but slip into the role of cancer confidant. He played the same one in real life. 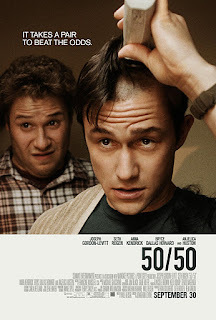 50/50 is the semi-autobiographical account of its writer, Will Reiser, who contracted Schwannoma neurofibrosarcoma at the same young age as Gordon-Levitt's character. He was convinced by Rogen and producer Evan Goldberg - who both helped Reiser cope with the disease - to share his story, and here we are. The result is a film about illness that is particularly sensitive to the balance a patient must strike between acknowledging his mortality and living the rest of his life. It helps demystify a disease that only crops up in pop culture in its extremes. Cancer is typically the garnish on triumphant stories of superhuman resiliance ("Every celebrity beats cancer!" notes Rogen) or the tragic accident that claims our loved ones and makes us want to appreciate/avenge them. It's no coincidence that Gordon-Levitt opens his post-diagnosis conversation with his overbearing mother (Anjelica Huston) with "Have you ever seen the movie Terms of Endearment?" The movie's frequent tonal shifts are handled skillfully by its cast and its director, Jonathan Levine, last seen helming The Wackness, a similarly funny-but-frank film about confronting the facts of life. Reiser's main stumbling block seems to be providing a villain that the audience can point to and identify. Enter Bryce Dallas Howard continuing her autumn of evil as Gordon-Levitt's unfaithful girlfriend. Primarily used to goose the protagonist's relationship with his sweet, overmatched student therapist (a luminous Anna Kendrick), Howard's character carries a conspicuous lack of nuance in an otherwise thoughtful film. 50/50 is also less than kind to medical practitioners, who are curt in the way that I've experienced with overbooked doctors blazing their way through a day of routine checkups, not ones advising patients to undergo a potentially fatal surgical procedure. But there's no shortage of emotion from Gordon-Levitt and his support system, some amusing, some uncomfortably raw. In the end, 50/50 doesn't only describe Gordon-Levitt's initial chances of survival, but rather the perfect blend of humor and heartbreak in a satisfyingly subdued story of persistence.